We went cross country skiing with a group at a wilderness center and it was actually a lot of fun. I wasn’t expecting to enjoy cross country skiing, but I did. What I didn’t love was the cold, so when we went to my sister-in-law’s afterwards and she had this spicy lentil soup ready, I was very thankful. Once I tasted it, I immediately asked my sister-in-law for the recipe. I noticed that I wasn’t the only one that day who asked for the recipe. It’s that good! This spicy red lentil soup is so delicious. It especially hits the spot on a cold winter day after cross country skiing! Saute 2 chopped onions in 2 tsp. olive oil. 1/2 – 1 tsp. cayenne pepper. Cover and bring to a boil, stirring occasionally. Reduce heat and simmer 25-30 minutes or until lentils are tender. Blend half the soup in the blender until smooth or use a hand blender in the pot for all the soup. Return to saucepan and stir in 1 can evaporated milk. Simmer 5 minutes longer until hot. 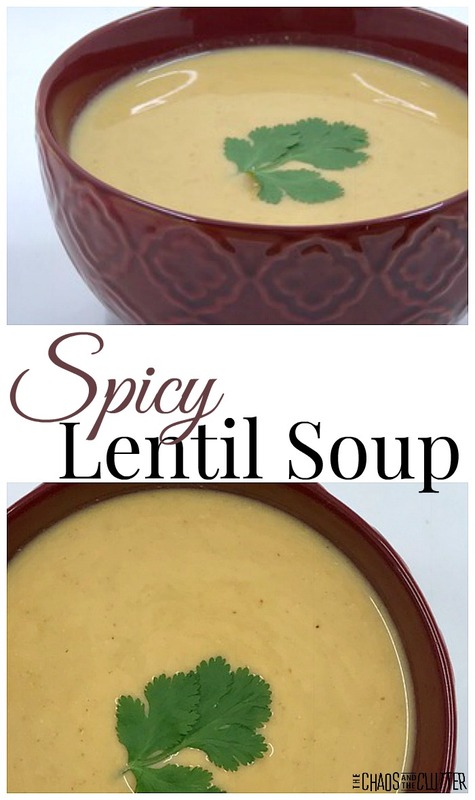 If you are looking for a lentil soup that is less spicy and has more vegetables, my healthy lentil soup recipe is delicious as well. This spicy red lentil soup is perfect to come in to on a cold winter day. 1/2 - 1 tsp. cayenne pepper. Add 3 garlic cloves, 2 tsp. ground cumin, 1/2 tsp. paprika, 1/2 - 1 tsp. cayenne pepper and cook for 1 minute. Add 7 cups chicken broth, 1 1/2 cups dry red lentils (rinse first), 2 Tbsp. tomato paste, and the bay leaf. There is something very cozy about Sloppy Joes, especially when served in the winter. It’s a meal that brings me back to my childhood and I assume will someday be one that brings my kids back to theirs! 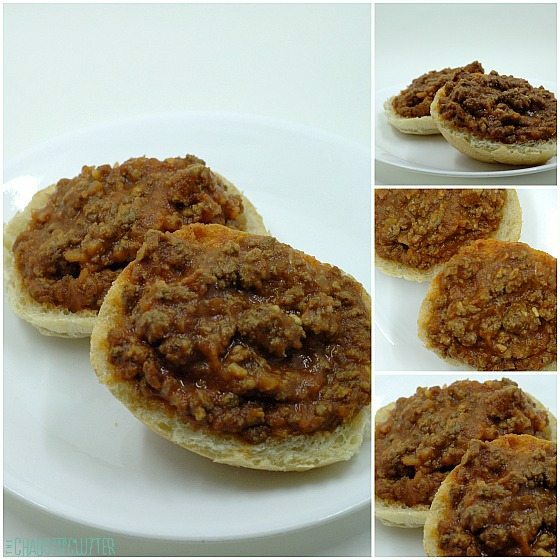 This sloppy joes recipe has that classic taste, but in the convenience of a freezer meal. This make ahead sloppy joes recipe has a bit of zip in it from the chili sauce. These can be heated either in the slow cooker or on the stovetop. There’s no reason that Sloppy Joes can’t be enjoyed by people who eat gluten free if they are served on gluten free buns. I’ve included gluten free instructions in case. Of course, if you are not on a gluten free diet, you can make this the same way and use your favourite buns. You can double, triple or quadruple this recipe and separate them into freezer bags to have Sloppy Joes on hand for busy days. Where did Sloppy Joes get their name? 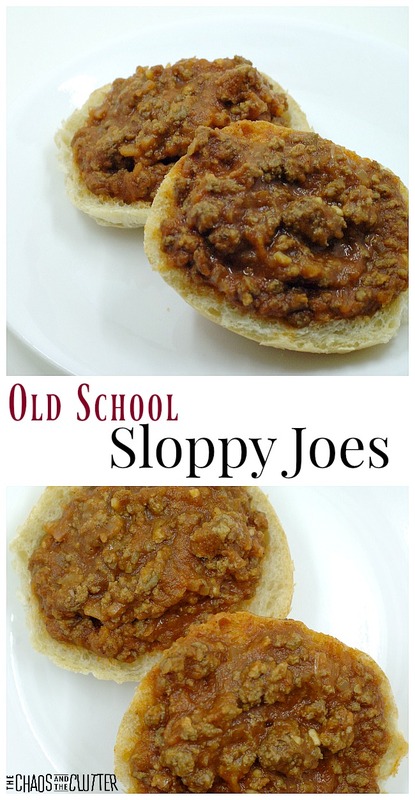 The “Joe” part of the Sloppy Joes is a bit of a mystery, but it’s easy to see where the “sloppy” part came from! Be sure to have napkins on hand. These are messy to eat, but that’s part of the fun! Some say that the name derived from a cafe in Sioux City, Iowa with a cook named Joe who added tomato sauce to his loose meat sandwiches way back in the 1930s, while others insist that the name came from the famous Key West, Florida restaurant, Sloppy Joe’s Bar. A smaller percentage of people insist that the name was born in Havana at Sloppy Joe’s Saloon. 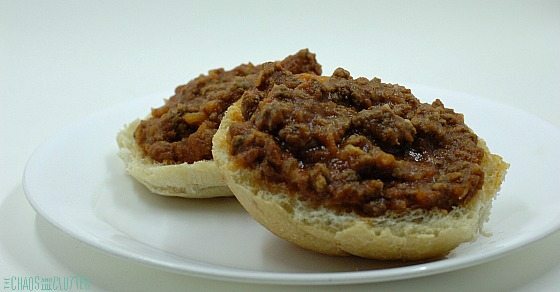 It’s hard to know for sure, but all agree that loose meat plus tomato sauce and sometimes other fillers served on a bun has earned the moniker “Sloppy Joes”. Based on an ad campaign from back in the 70s or 80s, they also became known by their nickname, the “Manwich”! *If you are making this sloppy joes recipe gluten free, be sure to use a gluten free Worcestershire sauce. To put this meal together, brown the ground beef. Mix the ground beef and all the other ingredients in a bowl and put into a large resealable freezer bag. Remove the excess air and seal. Lay flat and freeze. On cooking day, take the bag out of the freezer to thaw. 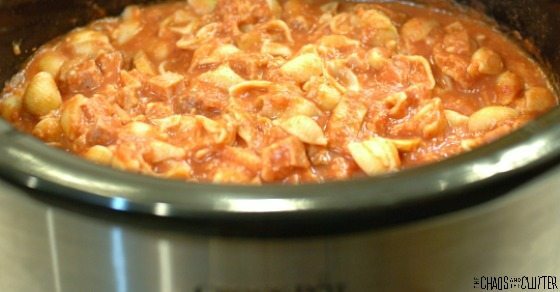 Cook in a crock pot for 2-3 hours on low or cook in a pot on the stovetop until heated through. Serve on regular or gluten free buns, sliced in half. Our family’s preference for gluten free buns is Udi’s whole grain gluten free hamburger buns. They are a great size and consistency for Sloppy Joes. There’s lots of ways you can dress up or personalize this family favourite meal. You can add pickles to the buns or top with cheese. You can butter the buns or leave them plain. You can even top these with potato chips (yes, really!). However you choose to serve them, this is one recipe your kids are sure to enjoy. This recipe is included in our Kid Friendly Freezer Meal Menu Plan. 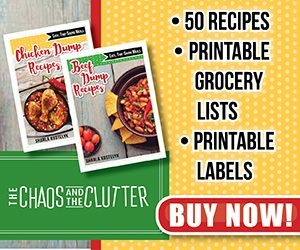 The other recipes are also kid-pleasers and the plan includes printable shopping lists, prep lists and printable labels making it easy to fill your freezer with meals your family will actually eat. To put this meal together, brown the ground beef. Mix the ground beef and all the other ingredients in a bowl and put into a large resealable freezer bag. Remove the excess air and seal. Lay flat and freeze. On cooking day, take the bag out of the freezer to thaw. 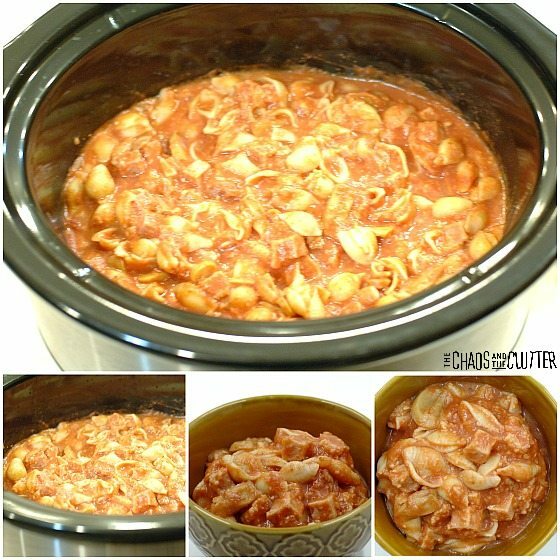 Cook in a crock pot for 2-3 hours on low or cook in a pot on the stovetop until heated through. Serve on regular or gluten free buns, sliced in half. *If you are making this sloppy joes recipe gluten free, be sure to use a gluten free Worcestershire sauce and serve on gluten free buns. It’s always hard to get an appetizing picture of a crock pot supper and this was no exception, but this casserole is really a kid pleaser! I often make a gluten free version of it, so I will be including that in my instructions below. 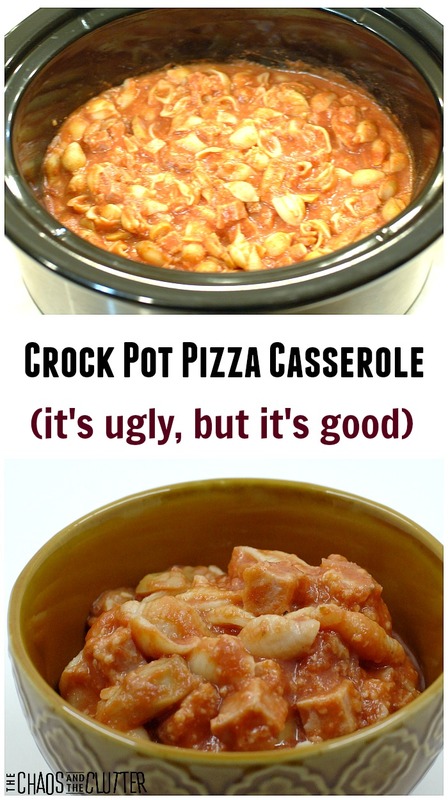 This crock pot pizza casserole is also a freezer meal, so it saves time all around. Having freezer to crock pot recipes on hand saves me so much time and sanity. This is one of the regular meals in my rotation. When I make it, I make two or four of these recipes at a time. The recipe below is for one meal, but if you want to make several at a time to freeze, then multiply the ingredients accordingly. 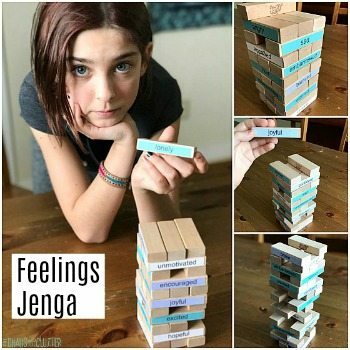 I find that most kids (mine included) are willing to try anything with “pizza” in the name. This meal is super kid friendly because it has pizza flavours combined with a home cooked comfort food feel. If your kids won’t eat mushrooms and green peppers, you can either leave them out, or you can get a little bit sneaky. 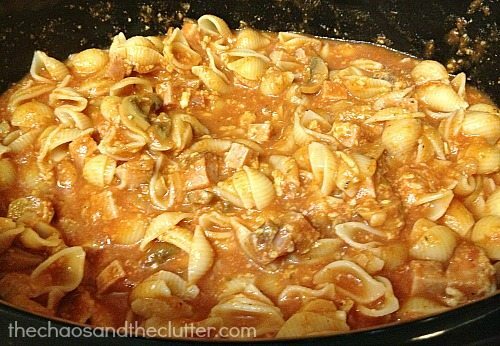 If you choose to go the sneaky route, just blend the mushrooms and green peppers into the tomato sauce. They’ll never know the veggies are there, but you’ll know they are getting more nutrients! To make this into a freezer meal, mix all the ingredients except for the pasta in a large resealable freezer bag. Place 2 cups of pasta in a medium sized resealable freezer bag. Seal both bags and staple them together. Be sure to staple above the seal to avoid leaks. Lay flat in the the freezer. On the day you want to serve it, thaw, put the ingredients from the large bag into the crock pot and cook for 4 hours on low. Cook the pasta on the stovetop according to the package directions and drain. Stir the noodles into the casserole just before serving. To make this gluten free, ensure that you use gluten free ham. Much of the ham sold in stores contains fillers that include gluten, so read the labels carefully. Use gluten free pasta of course. This recipe is very adaptable for those on gluten free diets and we enjoy it just as much with the gluten free pasta. 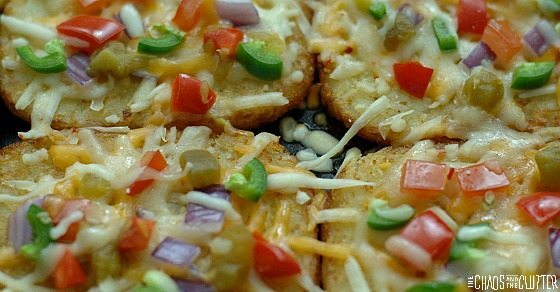 This freezer to crock pot pizza casserole is sure to become a meal that your family loves! Put 2 cups of pasta in a medium sized resealable freezer bag. Seal both and staple them together. Lay flat in the the freezer. On the day you want to serve it, thaw, put the ingredients from the large bag into the crock pot and cook for 4 hours on low. 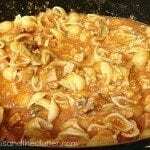 Cook the pasta on the stovetop and stir the noodles into the casserole just before serving. To make this gluten free, ensure that you use gluten free ham. Much of the ham sold in stores contains fillers that include gluten, so read the labels. Use gluten free pasta. One of our daughters has a tree nut allergy and for many years, has wanted to try a certain chocolate and nut spread, but of course due to her allergy, we can’t even have it in the house. To say that she (and my other kids) are excited that there is now a chocolate and peanut butter spread that is safe for her to eat is an understatement. The fact that it happens to be Reese Spreads, a taste they love made it even better. There were some squeals of glee and many suggestions of how we might be able to use it. The kids of course think that it is delicious on toast and used instead of the chocolate in s’mores, but they also seem to think that it’s pretty perfect eaten right out of the jar on a spoon. I have to admit that I quite agree with them! Inspired by the chocolate peanut buttery goodness, I created this simple 3 ingredient recipe for salted chocolate peanut butter popcorn that was devoured as quickly as it was made. I only managed to snag a few kernels for myself before my kids polished off the entire recipe! 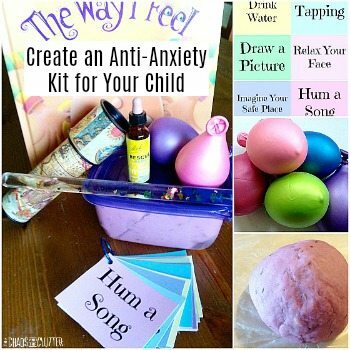 It’s a good thing it’s so easy to make. Pop the popcorn in whatever way you choose. I have an air popper but you can choose a stovetop method or the microwave if that’s what you prefer. 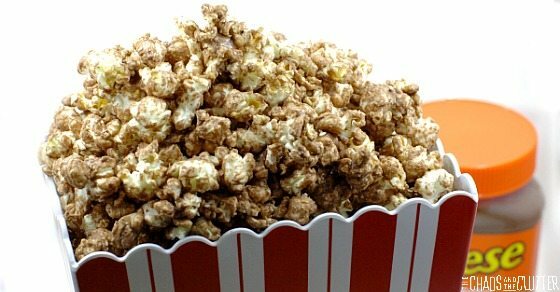 Pour the salted Reese Spreads over the popped popcorn and lay out flat on a baking sheet. Sprinkle with the remaining sea salt. Put the baking sheet into the freezer to harden. *Please note that microwave oven temperatures vary so you may need to adjust the cooking time slightly. You can also make this ahead of time and freeze it in resealable bags, being sure to take out excess air. 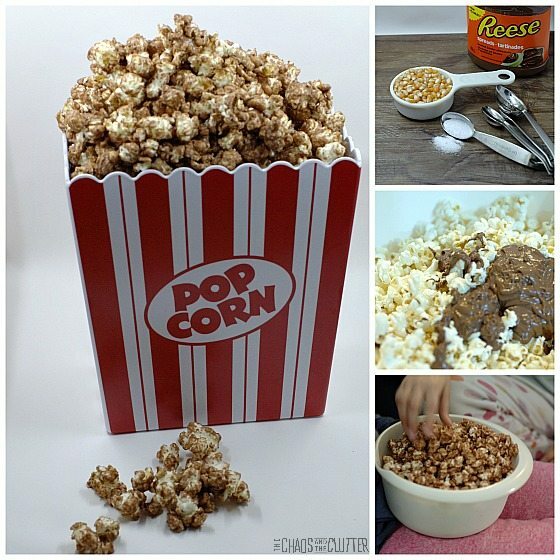 This will ensure that you always have a delicious snack to serve if company pops by unexpectedly or just to enjoy during family movie night. Inspired by the chocolate peanut buttery goodness, I created this simple 3 ingredient recipe for salted chocolate peanut butter popcorn that was devoured as quickly as it was made. I only managed to snag a few kernels for myself before my kids polished off the entire recipe! It's a good thing it's so easy to make. Pop the popcorn in whatever way you choose. I have an air popper but you can choose a stovetop method or the microwave if that's what you prefer. My love of nachos is well documented and well known! 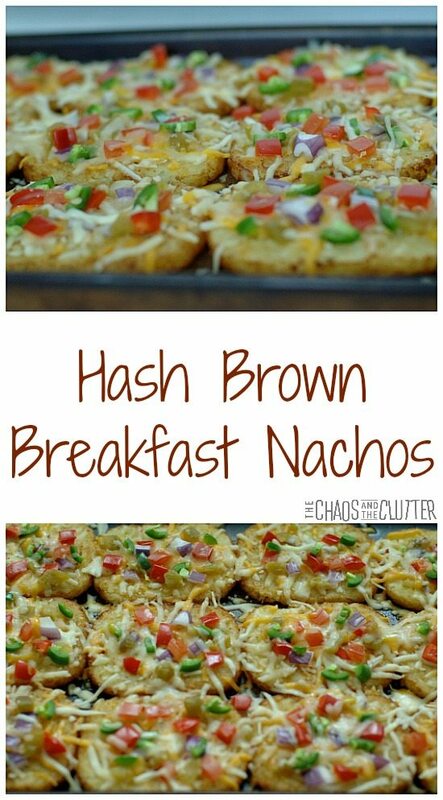 For me, nachos are the ultimate in comfort food so I simply came up with a way to be able to eat them in the morning. Breakfast nachos carry all the taste and comfort of regular nachos. When I first thought of this idea, I wasn’t sure if they would live up to the taste I imagined but they did not disappoint! These make a great family breakfast because they can all be made on one tray at the same time. It also offers many topping possibilities. I made mine meatless but you could easily add crumbled bacon or scrambled sausage. As long as you use gluten free hash brown patties, this dish is gluten free. Preheat oven to 450°. 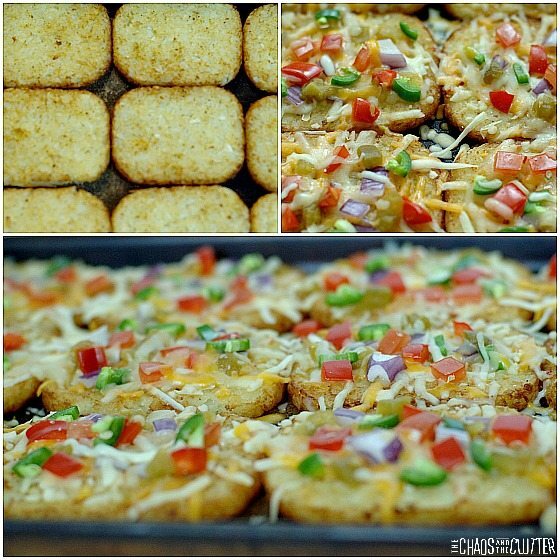 Line a cookie sheet with one layer of frozen hash brown patties*. This worked out to be 12 patties on my tray. Sprinkle with taco seasoning. To ensure lower sodium and no gluten, I use my own homemade taco seasoning. Bake for 15-20 minutes. If you are using a regular baking tray, you will want to flip them over halfway through baking time. I used a stoneware baking sheet, so flipping wasn’t needed. You want the hash browns to be crispy because you want that nice crunch. *If gluten free is a consideration, you will want to be sure to use gluten free hash brown patties. After taking the hash browns out of the oven, turn the oven down to 350°. Top the hash browns with shredded cheese (I used a blend of cheddar, jalapeño jack and mozzarella), diced red peppers, diced onions (I used purple onions but green or white onions would work equally well), diced tomatoes, diced green chilies, and chopped jalapeños. Be sure to seed the jalapeños if you don’t want too much heat. Add any other toppings such as crumbled, cooked bacon or scramble fried ground sausage. Top with a bit more grated cheese. Bake in 350° oven for about 5 more minutes, until cheese is melted. Serve with salsa, hot sauce or sour cream if desired. My kids had seconds of the breakfast nachos (and one had thirds!) so I would say that this was a big hit! Bake for 15-20 minutes. If you are using a regular baking tray, you will want to flip them over halfway through baking time. I used a stoneware baking sheet, so flipping wasn't needed. After taking the hash browns out of the oven, turn the oven down to 350°. Top the hash browns with shredded cheese (I used a blend of cheddar, jalapeño jack and mozzarella), diced red peppers, diced onions (I used purple onions but green or white onions would work equally well), diced tomatoes, diced green chilies, and chopped jalapeños. Be sure to seed the jalapeños if you don't want too much heat. Our son Einstein is on a gluten free diet. 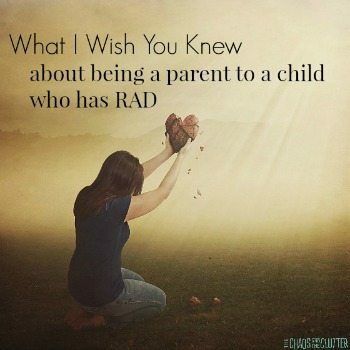 I am determined that he won’t have to miss out on things, especially during the holidays and on special occasions. 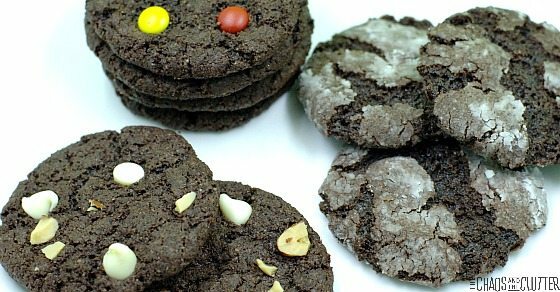 Last Christmas, among other gluten free treats, I made him these Chocolate Toffee cookies using a gluten free cake mix. This year, I decided to play around with the recipe a bit and make some other cake mix cookie variations. A cookie recipe like this is especially handy for someone who isn’t gluten free and therefore doesn’t have gluten free flours in their kitchen. All you need is to buy a gluten free cake mix box. After that, all you’ll need is eggs, vegetable oil, and your choice of mix-ins and you’re set. If you are attending or hosting an event where you know there will be those who can’t have gluten, you can still make these easily. Plus, they are delicious! *Note: The gluten free cake mixes seem to vary in terms of how dry they are, so sometimes 2 eggs is not enough to make these stay together. Start by adding two eggs and the oil to the cake mix. If you find that the dough isn’t holding together well enough and is very dry, add another egg. Put icing sugar (also called powdered sugar) in a small bowl. Mix together the basic dough and shape into balls. Roll the balls in the icing sugar and place on a cookie sheet. Leave space in between the cookies as they will get flatter as they cook. Bake in a 350° oven for 8-10 minutes. When you take them out of the oven, slap the cookie sheet down on the counter. This will help flatten the cookies a bit more. 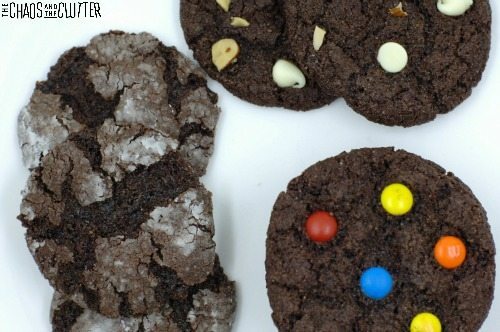 Mix M+Ms or mini M+Ms into the basic cookie batter. Form balls and place on a cookie sheet, leaving room in between the cookies as they will expand as they flatten. Bake in a 350° oven for 8-10 minutes. When you take them out of the oven, slap the cookie sheet down on the counter. Stir white chocolate chips and coarsely chopped almonds into the basic chocolate cookie dough. Form balls and place them on a cookie sheet, leaving plenty of space in between them. Bake in a 350° oven for 8-10 minutes. When you take them out of the oven, slap the cookie sheet down on the counter. This will further flatten the cookies. This recipe yields at least 4 dozen cookies. I made all three variations using just one cake box, so I didn’t give exact amounts for the white chocolate chips, icing sugar, M+Ms, and almonds because the amounts will vary depending on if you are making the entire box into one type or making two or three types with the one basic batter. And of course, if you want a fourth variation, you can always make gluten free chocolate toffee cookies. These are also made with the same basic cookie dough. You’ll love these cookies! If you are attending or hosting an event where you know there will be those who can't have gluten, you can still make these easily. Plus, they are delicious! I made all three variations using just one cake box, so I didn't give exact amounts for the white chocolate chips, icing sugar, M+Ms, and almonds because the amounts will vary depending on if you are making the entire box into one type or making two or three types with the one basic batter. 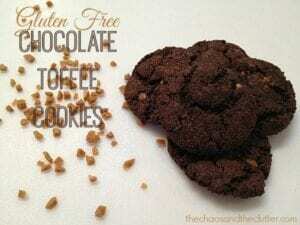 And of course, if you want a fourth variation, you can always make gluten free chocolate toffee cookies. These are also made with the same basic cookie dough. 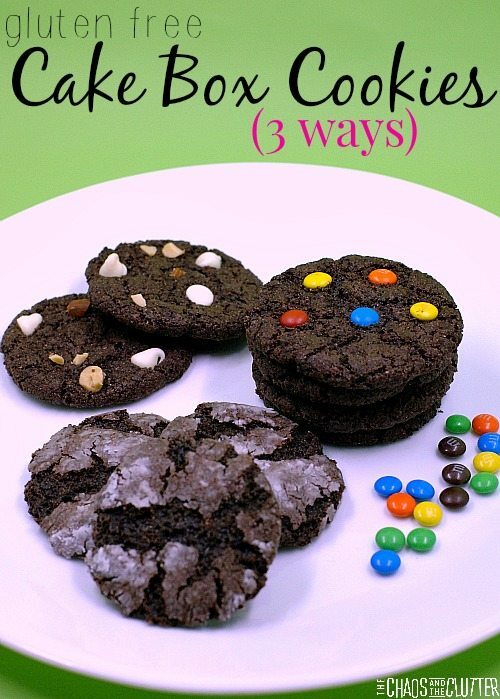 You'll love these cookies! Subscribe now to get 3 dump menu plans FREE including printable shopping list and labels. Your email is safe with us. This is a spam-free zone.